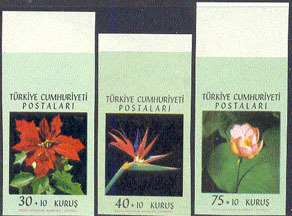 4165 ND TURKEY (1962) Poinsettia*. Bird-of-Paradise flower*. Water lily*. Set of 3 margin imperforates. Scott Nos B90-2, Yvert Nos 1618-20.